The stretcher on this painting had broken causing an overall loss of tension in the canvas, and major buckles in the lower left corner (where the stretcher was broken). 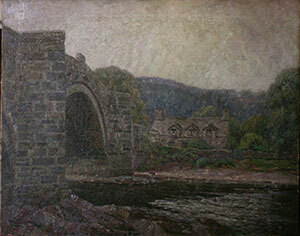 There were many other dents and surface distortions in the canvas as well as a thick grime layer covering the painting. 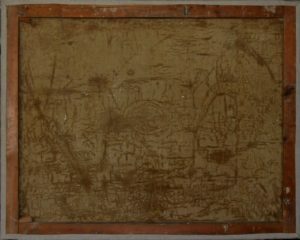 In this case the owner wanted to preserve the original stretcher because of an inscription and he preferred to have the painting unlined. In this case a strip-lining was performed to flatten and restretch the painting. 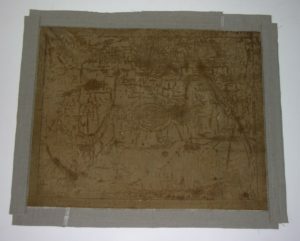 The reverse of the painting before treatment The break in the stretcher can be seen in the join in the lower right. 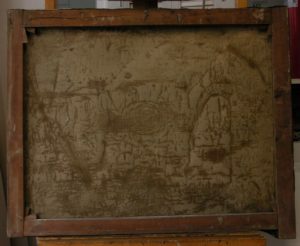 The dark lines on the reverse of the canvas are evidence of a cleaning where the solvent used to clean the surface of the painting penetrated via the cracks in the painting and left an impression on the reverse of the canvas. Detail of part of the inscription on the reverse of the stretcher The stretcher was inscribed with the artist’s name as well as the subject of the painting. Often information is written on the reverse of paintings. 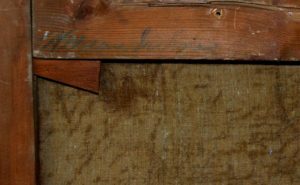 Strip-linings are an option to preserve the back of the original canvas when important inscriptions and signatures are present, although inscriptions can always be photographically documented in the case of linings. 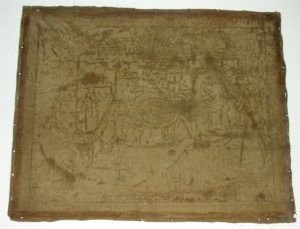 The painting removed from the stretcher and flattened with moisture and heat under pressure on a vacuum hot table. Reverse of painting after strip-lining Strip-lining, also called edge lining, attaches fabric to the reverse of the canvas with a reversible adhesive (here BEVA). The strips overlap the back of the painted design by approximately 3/4 of an inch and the strips are intentionally frayed to create a softer profile on the painting. The purpose of the strips are to allow for an overall reinforcement of the canvas where it folds over the stretcher bar as well as allow for extra canvas for the restretching process. 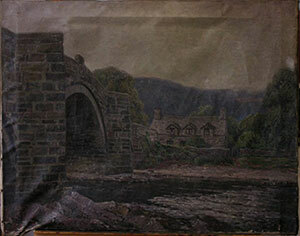 The reverse of the painting after treatment It should be noted that although strip-linings can be very successful, they will not flatten a painting as well as a full lining. In cases where the canvas is extremely dried-out and brittle, and especially where tears are present, a strip-lining may not be recommended.